Best Western Rama Inn est idéalement situé dans le centre de Ephrata. Venez découvrir et profiter de notre hôtel à côté des principaux sites touristiques. Réservation au meilleur prix et offres exclusives toute l'année. 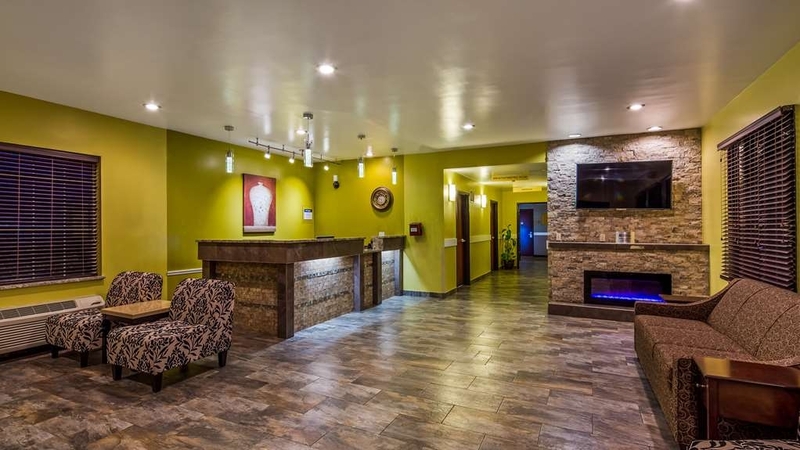 Bienvenue au Best Western Rama Inn !Les clients viennent du monde entier pour découvrir la beauté du barrage de Grand Coulee, à quelques minutes seulement de notre hôtel confortable d'Ephrata. D'autres séjournent également dans la région pour assister à un fabuleux concert au Gorge Amphitheater. De Sun Lakes aux festivals de musique qui durent toute la journée, tout le monde trouvera son bonheur près de notre hôtel d'Ephrata. Que vous préfériez les activités en plein air ou vous détendre et écouter votre groupe favori, vous séjournerez dans un hébergement luxueux ! Profitez des chambres confortables, impeccables et spacieuses et d'une literie luxueuse dans notre établissement. Notre piscine intérieure est un havre de paix après une longue journée d'aventures ou à profiter du soleil. Tous les clients de notre hôtel d'Ephrata bénéficient d'un excellent rapport qualité-prix. Avec un personnel amical et une réputation pour la propreté, nous savons que nos clients méritent le mieux lors de leur séjour. Notre emplacement en tant que seul hôtel d'Ephrata est ce qui attire les clients. Le festival de musique Basin Summer Sound est légendaire et les fans viennent de près et de loin pour y assister. D'autres sont ici pour les activités aquatiques et les fantastiques sentiers de randonnée le long des Gorges du Columbia. La pêche, la chasse et les activités en plein air sont un mode de vie près de notre hôtel d'Ephrata. Ephrata étant le siège du comté, le seul palais de justice dans un rayon de 160 km se trouve également ici. Votre séjour dans notre hôtel d'Ephrata récemment rénové sera un véritable plaisir après une journée d'aventures. Grâce à l'arrivée facile, les clients bénéficieront de tous les conforts de la maison. Dégustez un petit déjeuner de luxe gratuit composé de délicieuses gaufres, de fruits frais et de pâtisseries et d'une sélection de céréales et de yaourts. Terminez votre repas par un jus de fruits ou une tasse de café 100 % arabica. Les voyageurs d'affaires avec les autorités du Grand Comté, le département de la pêche et de la vie animale, et les militaires dans la région pour leur entraînement comptent sur nous pour leur fournir les hébergements calmes et impeccables qu'ils méritent. Réservez votre prochain séjour au Best Western Rama Inn pour des activités et loisirs en plein air !Passez un excellent séjour ! 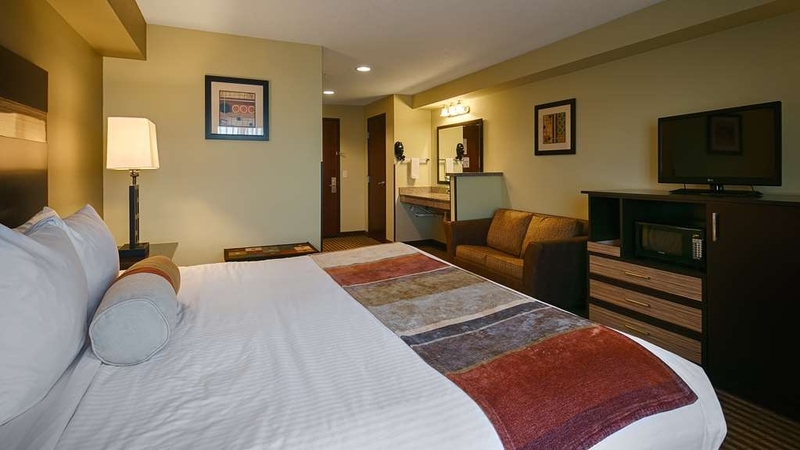 Clean, comfortable hotel in a small city. Others available are not as nice. Free coffee, tediously long old school check in, no view of anything. Just basic sleeping room. 150$/ night with tax included is too high for this hotel in this town. Thank you for your review and rating on our little hotel here in Ephrata. All rates of hotels are in the Summer Season, sorry you felt it was a bit more then expended. As for the check in process, I will look into this the limit I place on my staff at check in is 2-3 min. So not sure yet to whom was checking you in. We have been training a couple peps at the desk. Thank you again for your review, we love to hear them , so we are able to improve where we can. Have safe travels. Helpful Staff. Clean rooms, pool, hottub, and facility in general. Good hot breakfast. My word count is a little shy of their requirement here, so I must continue, but I am a guy of few words... I can't sing or dance. All I can say is the place added to a pleasant night visiting and training with friends at Imperial Jitz (jui jitsu academy) in town. Wonderful words! , Thank you so very much for the Great rating and comments. please feel at home when you stay with us here in our small town. Great to see that we had just what you needed. Please have a great spring and safe travels throughout the year. So wonderful to hear of your stay with us here in Ephrata. Please feel welcomed back anytime. Have a great and warmer Spring. The room was quite lovely and updated. One of the lamps did not work. The pool was out of commission due to leaks in the roof. The front desk attendant was very sweet!! She interacted so nicely with all the guests. Don't remember her name but checked in on Feb 17, in the early evening. Great customer service!! Thank you for the review, very sorry about the pool leaking, we have contractors here now starting to reroof before the snow fly's again. Thank you for being understanding with the hotel. So happy to hear of your stay with us here was to your liking. And thank you for the wonderful review and rating. Please feel free to join us again if ever in the area. I will let the staff member whom checked you in know that she was helpful and sweet. "Ephrata, WA Best Western is Awesome"
Wonderfully clean, update hotel. Friendly staff. Great breakfast, the waffles are the best. Nice Pool and hot tub. 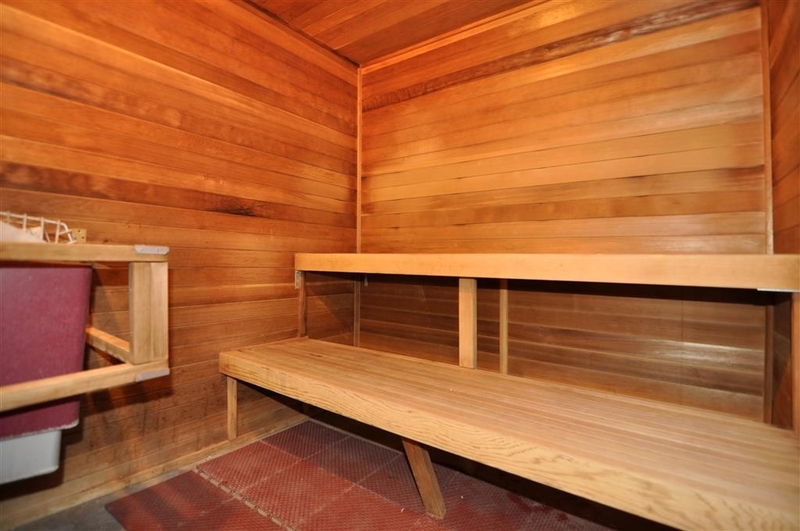 Also has a nice sauna. My husband and I are picky about our rooms now days and they easily meet our standards. Very Clean! Thank you , and oh so wonderful to hear of your stay here with us being just what you needed. Thank you for the kind review and rating, I'll be sharing this review at our next all staff meeting. Please come back and join us again if ever in the area. Stayed here with a group of about 20 cyclists, and we can't say better about the hotel, the staff were very friendly, the hot tub was great, as was the complimentary breakfast. We were all fueled up perfectly for our 80 mile bike ride. We travel from Canada to Southern USA every year and we always stay at Best Westerns. The meet or exceed your expectations most every time. The rewards program is a great bonus. The more nights you stay, the more free nights you get. There really are not many places to stay in Ephrata, but this hotel is still nice. It was clean, convenient, and a moderate cost. The staff was helpful and offered good advice about places to eat. No problems with parking or anything else. So great to hear that your stay was good, thank you for taking the time to fill out this review. And thank youfor the wonderful rating and comments. Our stay at the Best Western was pleasant - friendly, efficient staff, nice complementary breakfast and clean, well-supplied room. Had the beds been more comfortable, a higher rating would have been given. Three quarters of the hotel have brand new beds this year. I will look into the which room you stayed in, thank you for the comments . Good or bad it helps us , help others. Thank you for staying with us. Very nice hotel on the west end of town. The rooms are well maintained and clean. Front desk area and Pool are also well cared for. Staff is very helpful Also an excellent breakfast menu. Highly recommended! SO wonderful to see that your stay With us here great. Feel welcomed back anytime. Thank you for staying with us. Pickins are slim in Ephrata and, frankly, "Best Westerns" without the "Plus" added are a crap shoot. Sometimes you get a fifties era motel with rooms that open into the parking lot that has never been updated since, well, the fifties. But this place is really great and deserves the "Plus" moniker. Quite adequate breakfast, nice room (with a couch! ), and completely modern in every respect. Thank you very much the kind comments and good rating regarding our property. We strive to accommodate the best we can with a older property. Thank you again for staying with us and please fell welcomed back ANYTIME! They had another man checked into our room and yelled at us for having to give another person 50% off because our dog barked at the random homeless man they let into our room. Not a family friendly place at all. The manger charged us for a broken sofa bed because we pulled out the mattress and put in on the ground so our baby could sleep. They are also charging us for a dish washer that we reported broken before check out. The manger is extremely unprofessional and immature because she didn't like my comment on Google review she kicked us out and called my place of business to get me fired. She is a fraud and a child dont go here!!! Its a nice hotel to stay at. Its got everything you need for a business trip, even the printer worked at the business office. The staff were friendly and always said hello as they passed me in the hall. Plenty of staff! Thank you for your review and rating of our hotel and the staff. It truly can make all the difference when it comes to the hotel staff interaction, Please feel free to join us again anytime. And a wonderful rest of your summer. So wonderful to hear of your stay here with being just what you needed. Thank you very much for the great review and comments. Please come see us again. You are at the West end of town here. It's by far the best place available although it was more than I really wanted to pay, there wasn't a lot out there for a Saturday in July. I didn't take pictures, but it was a nice large room with air conditioning & good wi Fi which was nice considering the region was in a heat wave & it was 100 degrees outside. You have to drive back into downtown for services, but you should find what you are looking for. Thank you for your input , and the great review and comments. 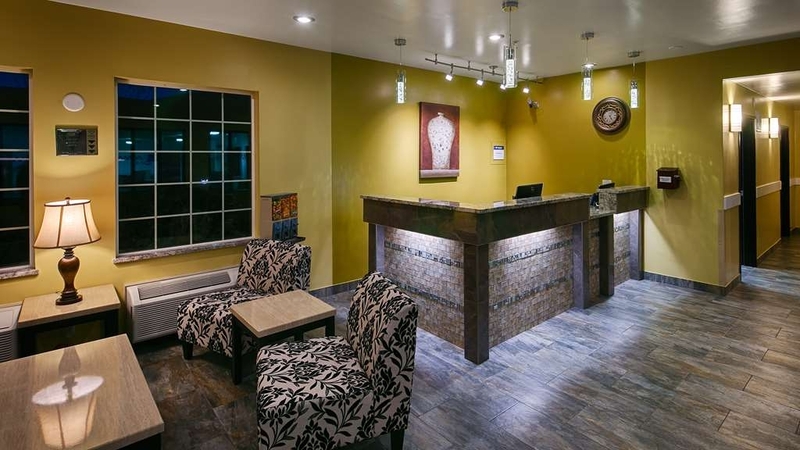 Glad to know that you were accommodated and your needs were meet for your stay with us here in Ephrata. Hope to have you come again if ever in the area. Great stay.. 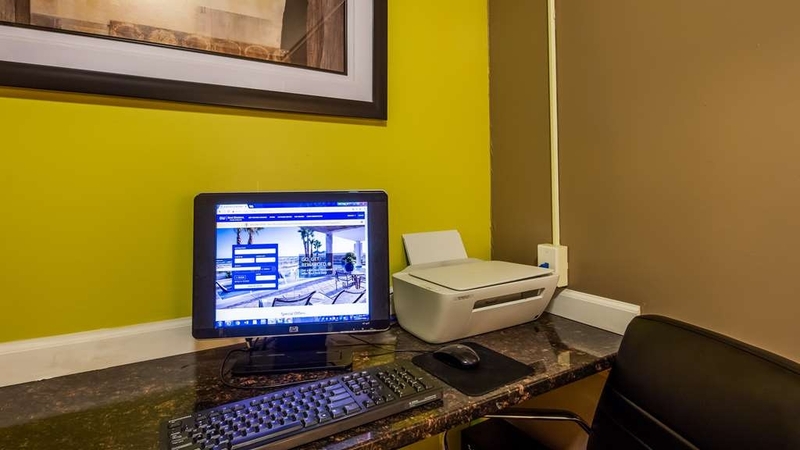 This Best Western consistently has courteous, helpful personnel and clean, comfortable facilities. Everyone ( especially the kids) love the pool and the courtesy breakfast has a great variety of food and drinks. This is always the whole family's first choice! Thank you for the great comments and we are so glad your stay was good. please feel free to come join us again. Enjoy the rest of the season. I had a lower room and could kind of hear the train. Room was clean. Pool was toasty warm and the pool and hot tub were clean. Breakfast room was huge and standard breakfast with lots of tables not to be squished together. The bed was Comfy and I slept fantastic. The next morning when I went to leave the hotel was bombarded by the new mattress deliveries. The housekeepers were unloading as were the maintenance guys. This owner should be very pleased with his safe. Everyone smiled, laughing and saying HI. Everyone looked you in the eye and didn't try to avoid you. I hope I am right in assuming that the owner must take care of his employees because it was a great group of people working. Clean hotel and everything worked fantastic. KUDOS!!!!!!!!!! Thank you so very much, it means a lot to hear all the kinds words. and yes we do love and put a lot of time and respect into our staffing. Thanks again and sorry about the inconvenience of the mattresses. Glad your night was good. Hope to have you return again if ever needing a place in our town . Have a wonderful summer season and safe. Form all the staff!! Thank you!!! Great hotel, best/most filling complimentary breakfast I've ever had at a hotel, eggs, bacon, bread, pancakes, cereal, etc. Fast internet, great friendly staff. I would recommend this hotel to anyone staying in this area. So wonderful to hear that your stay was good. please come back soon. Love to see and hear the great comments. Have a great summer season. Nice room, easy check in and out. I have stayed here before. It has always been nice. Good rate. The rooms have always been clean . Breakfast was nice. It is close to my work and easy to get back to the main highway. Thank you so very much for the grear rating and commetn. Glad to hear that you are a returning guest! Have a great and safe summer. We have stayed here several times and found the hotel very clean and the staff very friendly. Best hotel in Ephrata. Rooms are roomy and comfortable. Check in and out was efficient and the WiFi worked great. I thank you for the kind words, but why did you give us a 1 out of 5 for your overall stay? Please let us know if we did something wrong. But thanks again for the great comment. We stay here annually with a large group. This hotel always has the cleanest, most comfortable rooms. A great breakfast is included every morning. It always amazes me how friendly and happy the staff seem here. So very nice to hear of your stays here being clean comfortable! thank for the wonderful comments. And please come see us again! And have a wonderful , safe and cool summer. Thank you so much for the wonderful review and rating. We welcome your thoughts and comments. I will be passing on this great information to my staff as well. Please feel welcome anytime again to join us here in Ephrata. Have a good week. Drive safely thorough your travels. There's not much at all in this area so this is probably the best you're getting. They were unable to attach my rewards points at check in, and I had to follow up with a different employee at check out who was able to take care of it. Breakfast was actually pretty good. The ice bucket was across the hall from my room so ice noise and conversations were heard pretty late into the evening. I'd stay here again if I had to, but I wouldn't seek it out. Thank you for your comments, If you are able or have to need to stay in Ephrata again, please join us again, the newer section of the hotel is not by ice machine and the beds are great!!!. Sorry about the Points rewards not being applied at check in I will investigating this issye as well. But thank you for staying and have a wonderful summer season of travels. My wife and I didn't have many expectations when visiting Ephrata. We were in town to visit family. Check in was fast, and the staff was friendly. Our room was clean, the bed was comfortable, and the swimming pool was just the right temperature. Breakfast was about par for the course when it comes to an included breakfast. I had no complaints. The Best Western was also located in a fairly good spot down the road from where we were meeting with family for a birthday party. That worked out great for us! So great to hear that our property fit all your needs . We love to hear feedback, the wonderful rating as well. I will be sharing these comments with my staff this week. Please join us again if need be. And thank you for staying in our little big town. "Great place for a Canadian Snowbird to stop on way home from US"
Very clean well kept property - obviously the owners take pride in the property. 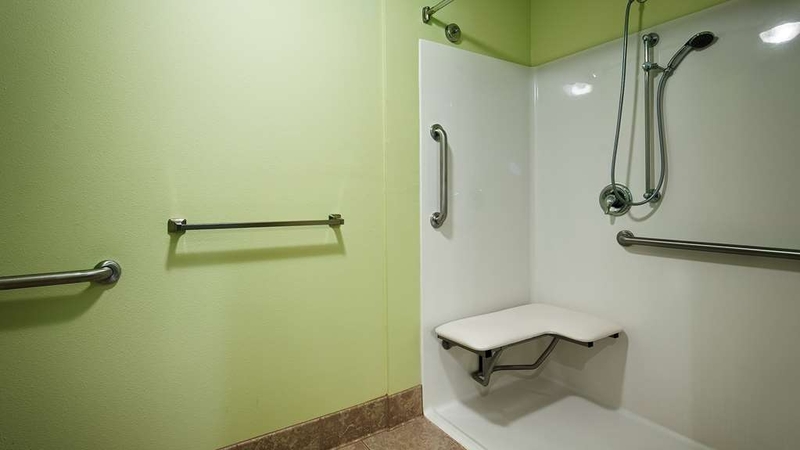 Rooms are very comfortable - bed comfortable, great shower. The breakfast was very good. First time at this property and will stop here again. Hotel was clean and bed very comfortable. Check in and check out was easy. I've stayed in a few Ephrata hotels and this the best one for sure. Breakfast included is adequate. I didn't use the pool or sauna but it looked nice. This is a very nice hotel with a nice friendly staff with one of the best morning free breakfast i have had in any hotel and will plan to stop there again soon.Staff gave me great advice for a local restaurant for dinner . Thank you for the great comments, and yes please join us again!! "Best hotel in Ephrata bar none!" If you haven't been to Ephrata, it's a small town that hasn't grown much over the years. 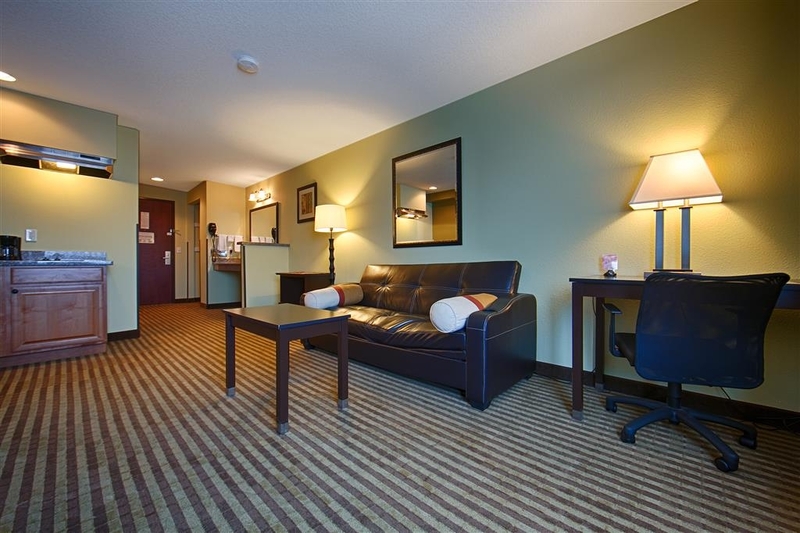 The Best Western Rama Inn is the most modern business in town and the by far, the best hotel to stay at. The staff are very nice and the rooms were very nice, modern and clean! We will definitely stay there again. Thank you for the wonderful comment, and please feel so welcome to come stay again. Tis is a small hotel in an even smaller town, The room was nice and the pool was good as well. Everything seemed to work as it should. There were no troubles with this stay. The snow outside was fitting for the time of year and it brought a beauty to the landscape surrounding the hotel property. Thank you for your comments, please join us again if ever in the area. "A great stop half-way through our trip"
Thank you for your business. And yes we are changing out bedding in this coming spring... At least half the hotel , the newer section has been done. Thanks again for the great review and please feel welcome to join us again. Have a wonderful new year. "Best Western does nice job." Nice quiet motel, good value, no competition in this small town. Enjoyed the staff and cleanliness of rooms and lobby areas. Fresh cookies were appreciated late at night! Pretty good breakfast, too. We have family in the area and stay here when we need lodging. Thank you for the kinds words, so glad that your stay with us here was good. We love to please!!!! Have a great new year and we hope you can join us again. Thank you for the review, sorry to hear that our service was not up to the normal standards. I will looking at getting to bottom of that. Glad the rest of your stay was worth the drive. Thank you Please join us again if ever need be. "Nice hotel with outstanding service!" Clean, quiet, comfortable and a nice breakfast. In room keurig machine, refrigerator and micro if needed. A popular stop for workers in the central WA area. Indoor pool (heated) and a spa available. Ephrata has some good restaurants as well so this is a good stop if traveling through or hanging out in the area for a while. So great to know that your stay with us here in Ephrata was good, your welcome back any time. Thank you for the nice rating. Very pleased with this place Just stopped in on our way to Las Vegas after a bad day on the road This was great nice and clean good service and nice pool and great little pub next door great bar food and cold beers What more do you need ?? So very nice to here of your stay with us being to your liking, please join again if ever need. And safe travels to you and yours during these holiday seasons. 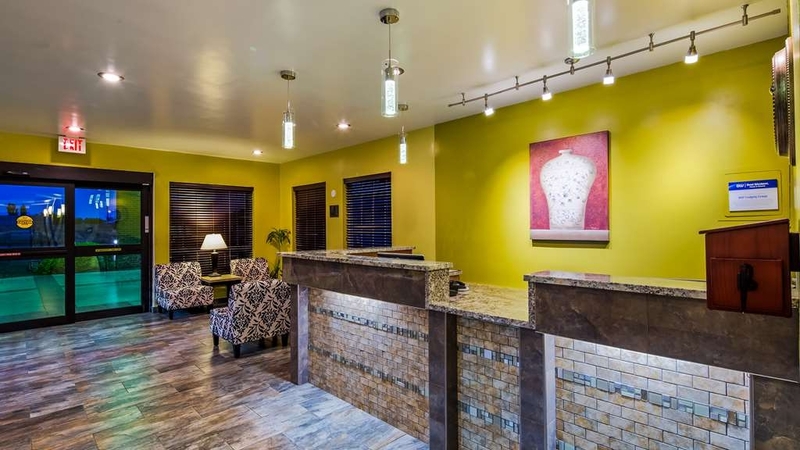 "Overall vey clean and friendly staff"
I would definitely stay here again as beautiful friendly girls with positive attitudes and a very clean hotel. Easy access overall great job accept the few things I addressed about updating a few things and tv's with quality of cable services. Internet seemed to always work and no problems there. Thank you for staying with us and your recommendations. I will pass on the comments of all to my staff and ownership. Thanks again and please come again. I wish all small town hotels were as nice as this one. After a few bad experiences with small town hotels, my expectations were low, but I was pleasantly surprised. It was very nice and well maintained. The staff was very friendly and the breakfast was better than I expected. I held back one star because there was no outlet for my phone charger next to the bed. My whole life is on my phone, so I don't like to have to get up and walk across the room to check a message in the middle of the night. The other minor quibble is that they built it right next to the railroad tracks, so if you are a light sleeper, like me, you are gonna get woke up when a train goes by. It happened twice that I remember. Other than that it a very good choice if you are in Ephrata and I'd certainly stay there again. Very sorry for the out let and your right there should of been one so that you can charge up. Thank you for the comments and great review, please come again. "Very comfy and outstanding customer service"
I was completely impressed with the rooms, staff and breakfast. I think every staff member that I pasted was friendly and greeted me. Very impressed. The breakfast had some great options and was clean and everything was fresh and very tasty. Thank you kindly for all the dear words. I will let all me staff know. Please feel welcome again. Have been staying here for years during our fly fishing trips and can't beat the deal or the hotel. Recommend this place to all my friends due to the free breakfast, comfortable beds, pool and hot tub. So very wonderful to hear of your stay with us. Please come again, and FISH ON! My experience start to finish was great. Friendly staff over the phone and in person. Very nice rooms and common areas. Treat bag for myself and my dog upon check-in. I would stay here again. I do wish that the cost of the rooms were just a little cheaper. Thank you for the rating. Glad to hear that you enjoyed the treats. Its always a good feeling to be welcomed for sure. Thank for the comments and As of Oct through April we are now in our winter season with a little cheaper rate. Hope that helps you out in the future. Thank you for staying and please feel welcome to join us again. "Pricey but all you got"
Only decent hotel if you want to be in town Ephrata, which I did. It's a pretty standard higher end hotel. Our main issue was it was a tad pricey and that we were not able to use the pool or hot tub due to kids clogging it constantly. An "adults only" time for the pool/hot tub would have increased my satisfaction with my stay significantly as my elderly mom was with me and was very disappointed to not get to sit in the hot tub. Overall, you get what you pay for and I am sure I will be back as I go into town regularly. I was on my business trip in Ephrata and I stayed in Best Western, Rama Inn. Employees was so friendly, I enjoyed my stay and breakfast in the morning had good variety of food and internet connection was excellent and i was be able to finish my work. So very great to hear that your stay here in Ephrata went well. Please feel welcome back anytime. Thank you for the great review. "A comfortable mid-size hotel in the heart of fruit country"
This facility was clean with a large swimming pool. 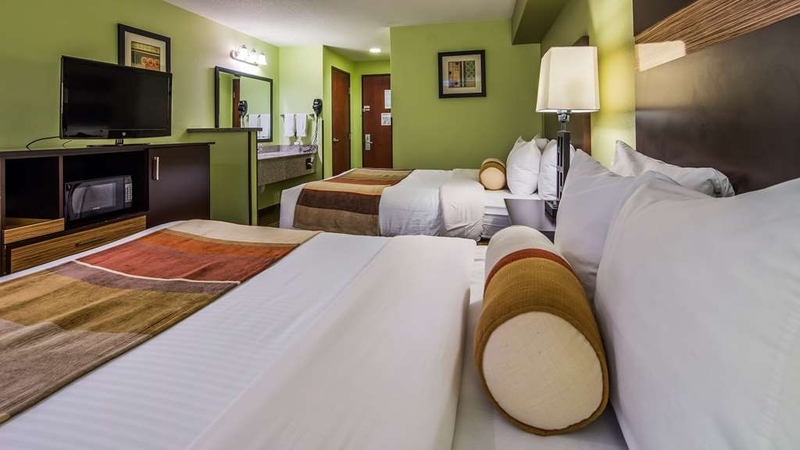 Rooms come fully equipped with a microwave, guest laundry room, and a large fridge. The hotel is located on the main road. check-in was smooth and fast. Thank you for the great rating . Hope you can join us again. 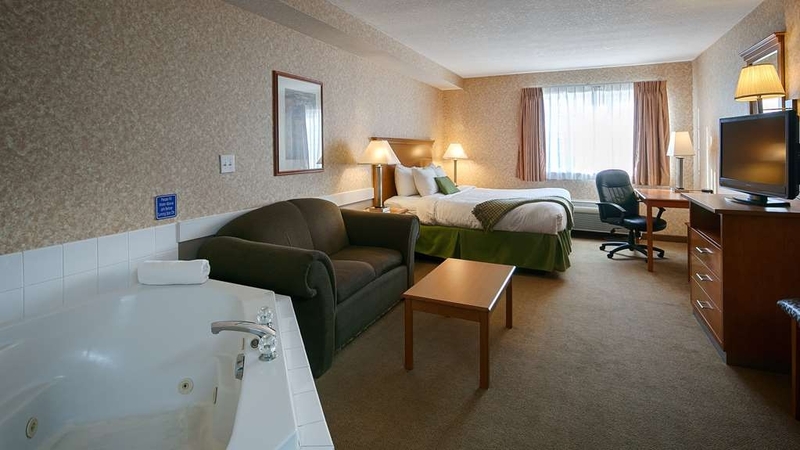 The Best Western Rama inn is excellent and provides a 'plus' experience even though it is not classified as one. Very pet friendly. Pool is large. Definitely would stay there again when in the Ephrata area. My wife and I were pleasantly surprised with our stay here. The staff were very welcoming and pleasant from the front desk to housekeeping and grounds people. Room was just right and the breakfast was just right with a combination of cold and hot food that didn't taste like cardboard. Fully recommend this property if you are in the area. Oh how wonderful to hear of your stay here with us was to your liking. In hopes that you may be in the area again, your welcome back at any point. I will pass along the nice comments to my staff. Thank you the rating, have a wonderful rest of your summer. "Inconveniently located out of town"
This is a standard BW with no distinguishing characteristics. Unfortunately, it is located on the south edge of town with no acceptable restaurant choices nearby. (There is a honky-tonk bar with bar food next door at a gas station. All male clientele and not a good place for families. This required us to jump back on motorcycles in our "civies". Sorry for the inconvenience of the location of which the hotel was build. But thank you for your feedback. We appreciate your business, and again sorry for the lay out of the location. The small is growing and we are in hopes that something like a family type of restaurant will be located by us with in the next couple of years. 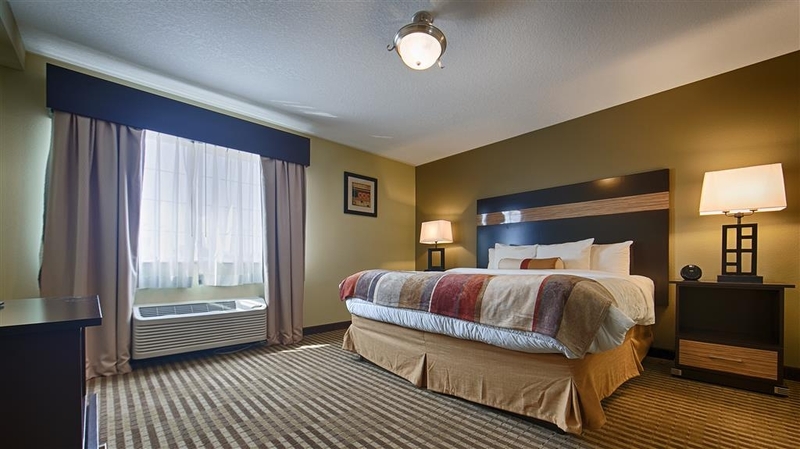 "Great amenities & perfect spot to stay close to the Gorge"
Comfy King bed, indoor pool, full breakfast. There was a passing train that periodically passes by outside but we didn't hear the noise from our room once. We drove from Seattle and opted to get a room at the Best Western rather than drive back after seeing a concert at the Gorge. So glad we did. Very comfortable nice room with A/C, pool, spa. I was surprised how nice the breakfast was. Two types of eggs, biscuits with sausage gravy, waffles, cereal options, yogurt, juice & more!!! Great value. Thank you for noticing our updated breakfast items. Love that type of feedback. In hopes that you are wanting to enjoy another show at the Gorge, your welcome back. Thank you for the great rating. "Great value and best place to stay in Ephrata"
We only stay at this hotel when in Ephrata because it is the best place in that small town. The room is just fine and the bed was just like we like it. 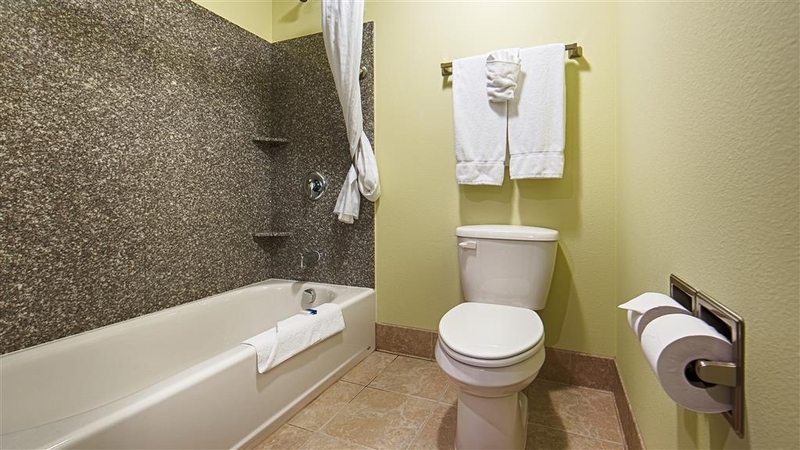 The only drawback is that the sink is in the main room not with the toilet. Org wise everything was just as we expected for a good value hotel. Glad to hear of your stay here with us was good. Thank you the great rating . Please feel welcome back anytime, and thank you for staying. Everyone is very friendly. They get very busy and they work very hard, so just be patient. They go over and above. We did have a maintenance issue and were inconvenienced and the management made it right! Much appreciated! Next trip to the Gorge, this is the right place to stay! Thanks so much! So wonderful to hear of your stay here with us being a memorable one. Hope the show was good too. Thank you for your comments and please come see us again if ever need be. This stay would have been perfect if the pool and hot tub were working. I was in town for one night just for a funeral and decided to pay $45.00 more just to have the pool and hot tub for the kids, however they did not tell me the pool and hot tub were closed for the night due to some rainstorm the night before until after I paid and asked when the pool closed. The stay was still nice, beds were comfortable, and breakfast was good but I could have paid $45.00 less and stayed at another hotel with no pool. I just wished they had told me before hand so I could make that decision. "Best quality hotel in Ephrata"
Best Western in Ephrata is a very nice hotel with all the amenities I have come to expect with this brand. Breakfast had a full range of options including waffles and fresh fruit. Our king bed was very comfortable and the room was clean. They even had an elevator to access the second floor. Perhaps the only negative would be the train tracks running behind the hotel that might create a problem for light sleepers as several trains did pass by. So very nice to hear of your stay here with us was good. Thank you for the nice comments and we hope you can come again to our little of Ephrata. Beds are being replace in the older section, but there are 36 new renovated rooms with new beds, sorry you had a older room. We don't carry powered eggs? I will be bring these matters up the staff in regards to the other issues you had here, very sorry that your stay was a unenjoyable one. Thank you or bring this to my attention. Thank you dearly for the very kind review and rating. Its meaning so must to be able to give our guests the best stay while here. I will be passing this onto my staff at our meeting this coming Monday. Thank you again, please feel at home and welcome to join us again anytime. "Had problems but staff was excellent"
Pool needed repairs during stay but staff was very helpful. Others in our party had problems that were Members of our group has problems which the staff addressed promptly and we were compensated for no pool access on the second day of our trip after calling the manager the next day. Sorry for in inconvenience during you and your family member stay . There were a few issues that were our of reach but tried very hard to get in touch with them and fix them to best of our ability with in a timely matter. Again sorry for the pool issue. And we Hope that you are able to join us again. Thank you for the rating . We stopped here for one night and we were very pleasantly surprised. Very nice hotel for a chain hotel. The desk staff was very pleasant and friendly. Clean room. Well lit parking. But the best part was the nice breakfast room. I've gotten to where I don't expect much from the chain hotel breakfasts with the cramped spaces and limited food selections, but this was an exception. 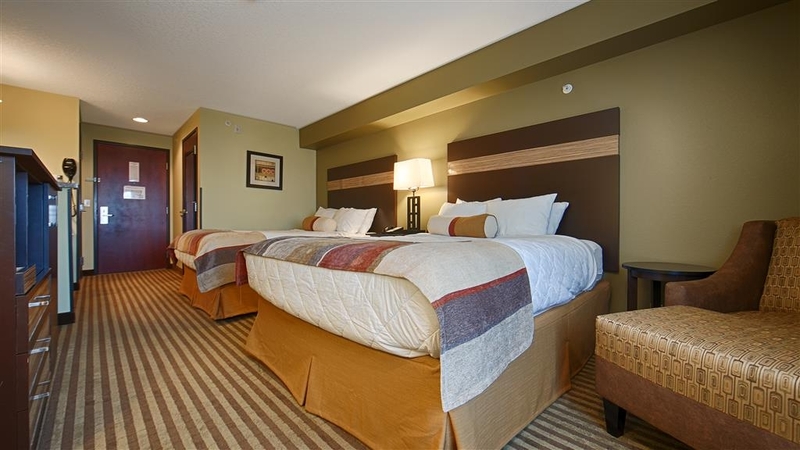 The room was large, very clean, and staffed with a very nice lady who was making sure everything was just right. The food selection was very good with hot food, cereals, waffles, biscuits, danish, fruits, juices, yogurt, etc. Excellent value. Thank you for the wonderful comments, please join us again. So good to hear that you were able to enjoy some of the amenities of this property. Thank you for putting in a good work for us here, and we welcome you back anytime. I recently stayed at the BW in Ephrata during a family reunion, which was held in their meeting room. All staff I interacted with were wonderfully helpful and friendly. I have stayed here in the past and will do so again, it is a well-maintained, up to date facility. The pool and the breakfast were the favorites The room was relaxing and very clean. Great place for families the staff was always smiling and very helpful. Definitely recommend this place to others for a stay. Great to hear of your stay with us here was good. Your welcome back anytime. Thank you for completing the survey and have a cool wonderful summer. 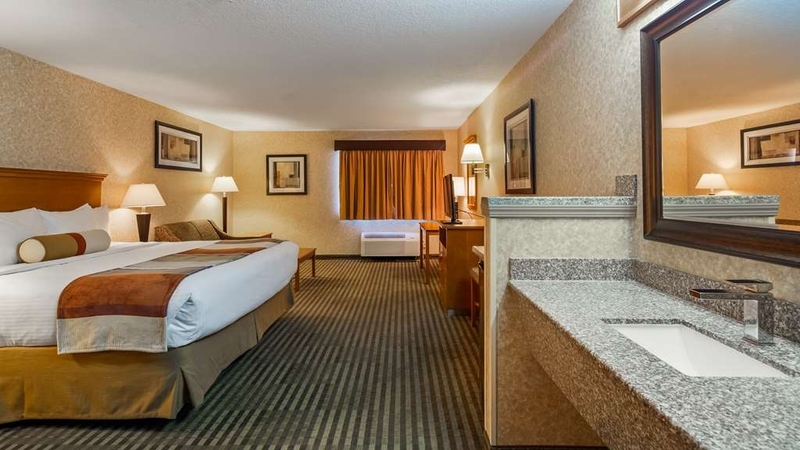 Well appointed room with a Keurig, small fridge, microwave, good wifi and a comfy bed! Really good breakfast includes waffles and biscuits and gravy. Hotel décor updated- love the carpets. Unexpectedly nice stay in a small town! Thank you for the nice comments, and So glad you enjoyed your stay with us here. Please feel free to join us again if ever in the area. Have a wonderful rest of your summer season. We checked in late in the evening around 10pm. Found the staff to be very friendly and helpful in finding discounts to apply to our room fee. Also was the only place that had a room available at the last minute in the area. Other hotels nearby were very small in size and were sold out. Thank you for your review and comments, so glad we were able to accommodate you in the last minute. Feel free to come join us again if ever need be . "Unhepful staff, amenities not working"
Paid extra for a suite with an in room jacuzzi. The water never got hot and we couldnt use it. I told the lady at the front desk at checkout and she didn't apologize or try to ammend the situation at all. Terrible customer service. This has been a very nice stay. From what I needed I am very happy with this stay. The people that helped me were very nice and helped when i needed help they were so very courteous. The rooms are very clean. There are other questions I think should be asked but I admit it would have to be a persons preference on where things are. Thank you for the wonderful review, and yes please feel welcome to give us idea and comments for use on our property. Thank you again. 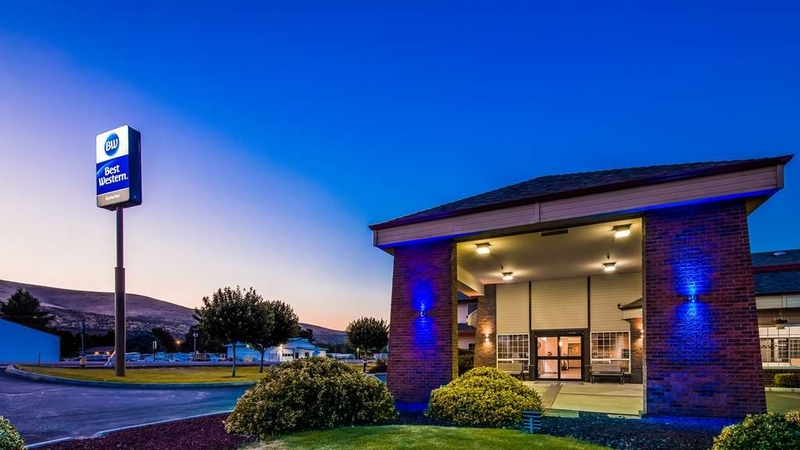 "Great hotel in Ephrata, WA"
Ephrata is an out of the way town in eastern Washington. I wasn't expecting to find this modern, very clean hotel with all the usual and expected amenities. Room was very nice, very clean, and very quiet. We were very pleased with our stay, and I would definitely recommend this hotel for its location, cleanliness and comfort, as well as the very friendly and helpful staff. Wonderful to hear about your stay with us here. Please come again anytime. After a bad experience at the Liberty Lake location over the 4th of July weekend, this location was a pleasant surprise. My son and I shared a king room. We were there for the Babe Ruth state playoffs. Room was relatively large and comfortable. Very clean and up-to-date. My only complaint was the bed which felt like sleeping on a sheet of plywood. At one point, I reached down and touched the mattress to determine if there was actually any padding... For a moment, I thought we might be sleeping on the box spring. Others in our group did not have a similar experience with their beds. Our room was 225 for those interested... Breakfast was great. Especially the eggs with salsa and cheese folded in. Unfortunately for the boys, the pool had been drained prior to our arrival. Overall a great experience and recommended. Thank you for the great comments, please join us again. A very poor stay! Although the staff was cordial they were absolutely unresponsive! On returning to the hotel after a wedding we found the hotel doors, although card keyed, locked. As the hotel's parking lot is located at the opposite end of the building this required about a hundred yard walk from where we parked to the lobby and then a walk back down to our room at the other end of the building near where we parked. On noting this to the evening staff I got more or less "This is the way it is." As walking is painful for me I found this take it or leave it attitude poor at best. Sunday morning we went down to breakfast at 9 AM only to find no food, not even scraps. It was obvious that they had started shutting down around 8:30 AM. The person running the breakfast (and the front desk) told us breakfast closed at 9 AM. However we were told when we checked in that breakfast closed at 9:30 AM. Subsequently three or four other families who were traveling with small children were also told the same thing. Even though we all voiced the same concern the person running the breakfast just smiled as she continued to shut everything down. It was very obvious that she didn't give a d*** about the hotel's guests. I would avoid this hotel at all costs. It is obvious by their egregious behavior that their guest's comfort is not a priority to them. Sorry you were having to walk, but for security reasons and safety for all guests and employees after ten pm daily all guests must come through the front doors. As for the Breakfast times, it is stated in the directory, on line, and also on the door of the breakfast room, and all guest all told at check in where and when the breakfast is located and the time frames. I m am very sorry about your stay with us here. I will speck with my staff to insure that issues or problems like these don't come again. Thank you for the comment , I wish there was something said to management before exiting property. Will be improving. I've been staying at various hotels and so far staying at Best Western was the best experience thus far. It was a fast check-in and speedy check-out. I'm definitely going to be using Best Western hotels again for my future stays. "Great service and great people! Loved the weekend stay!" Forgot the girls name but she was blond and had a feather tattoo on her forearm. Her and the other stuff made this stay great. The staff at night were also friendly and very helpful! There was someone around at all times to help out, really cool! Wonderful to hear that our staff was welcoming, I will let them hear about this during our next team meeting, please come again if ever in the area. Thank you again for the nice comments and review. The staff was friendly and helpful; the rooms were nicely appointed and spotless and everything functioned well; the pool area was clean and tidy; the rooms were quiet. I liked that you could open the windows for fresh air and the sheets were unscented. There is also plenty of light where you need it - a rare thing in motels. 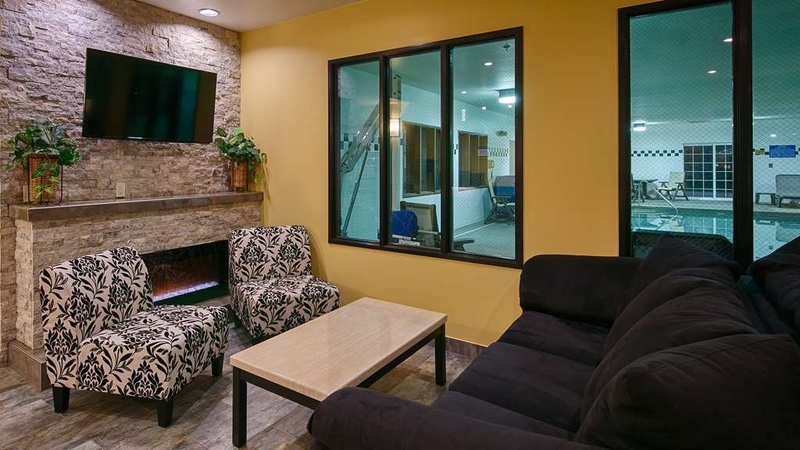 So very good to know that our property provided you with the amenities you needed and more.... Please join us again , from all the staff here, have a great summer season stay cool out there. Solid Best Western local.When in Ephrata, I'd be surprised if there's a more comfortable/polite hotel. Slept well on rear facing side. Either I showered too late (9am+) or couldn't operate lever precisely enough to get a really warm shower. Best Western Breakfast Report: Above average on a whole. Breakfast Manager was very attentive. No Melon but there is BACON! Actual Bacon strips cooked nicely-Redeemed everything. So nice to know that your stay with us was ok. Thank you for the comments and review. We will work on getting some in season fruit, sounds great!!! Have a great summer , please join us again when in the area. "No pool , I should have been told at check in that the pool area and jacuzzi was out of order, before I checked in." I think we were away all the time but I love them just because of the amp a theater also the lady did not know if the pool and jacuzzi where not working before we checked in and paid this ridiculous price. Sorry that your stay was during our time of the pool closer. The websites states dates of closer. And there are signs at the front desk and on the pool area. The hotel was hit by lighting and we have been having the repair for the roof. This was an act of god and our of ours hands to control. We placed the signage online last month. sorry for the inconvenience. I hope you understand. And are willing to come see us again. "Clean & Comfortable book early"
This is the cleanest and most comfortable place to stay in the area. It fills up fast for good reason so book early. The breakfast is about on par with most options and the beds are firm. The staff are very friendly and pleasant. "Very good rooms and great service"
Part of a fishing trip, we stayed here for 4 nights in early May. The hotel was really much better than we expected, the rooms were large (we had a double queen bed room) there was a sitting area, the vanity was a good size and the bathroom was fine. The hotel staff were very helpful and pleasant, also a good "included" breakfast that started service at 6am, so we could fill up before our fishing day. We also had a fridge in the room for our beverages. 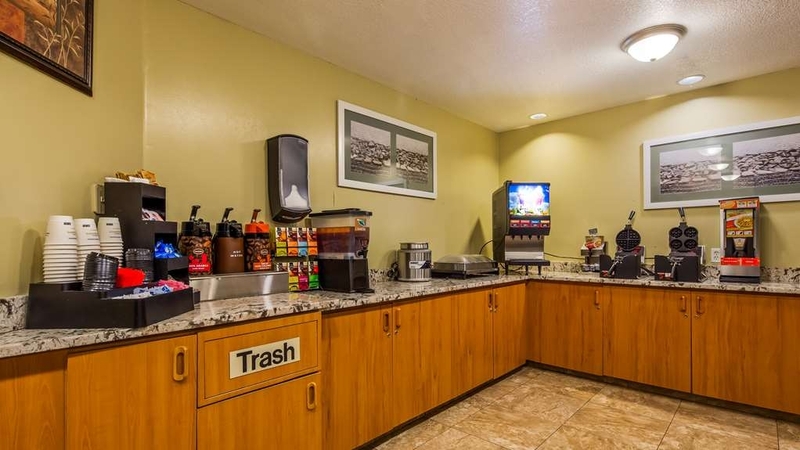 The hotel is clean and has most amenities yet the service is excellent. Each time I call to get a reservation they are helpful and never mess anything up. They are pleasant upon arrival and for anything you may need. My last trip to this location was the sixth in the last year and I continue to stay at that location rather. So great to know that you like staying with us here, Please feel welcome anytime. It was a decent hotel, with average food and rooms. We had a suite with a jacuzzi tub, but the tub was dirty and the toilet only worked about 50% of the time. Front desk however, made up for the room problems. They were both very nice and helpful. Very sorry to hear of your stay not being clean,,,,, And the toilet has since been replace, thank you for your comments, its good to be able to get the guest experience good or bad. Again thank you for staying with us. Hope you can come again. The staff here are great. They are very welcoming and helpful. I walked into my room and was surprised at how nice the room smelled. My room was clean and well stocked. Had everything I needed for a quick overnight work trip. So great to hear that your stay with us here was good. Welcome back anytime. Have a good spring. When you are stopping over at a small town, you just don't really expect to find such an amazing hotel. The Staff was super and went above the call on a few questions we had. The room was super clean, and the breakfast area was clean and kept replenished with whatever food ran out. Again, the staff was super friendly and just cheered up your morning! Don't think we will be ever coming back thru this way again, but would highly recommend it if you find yourself here! So glad to hear of your stay with us here was a great one. Thank you for the wonderful comments, and have safe , fun travels to you and your family throughout the year. Very nice hotel. Best in this small town. We had one of the pet friendly rooms and I appreciated the easy access for walking the dog. Good breakfast. Very friendly staff. I have never been disappointed at a Best Western. Wonderful to hear of your stay here with us was good. Please feel welcome back. Thank you for the wonderful comments. But why was a 1 marked in every area? Please let me know if this was a mistake, we get scored on this reviews and if there was everything wrong with your stay then please let us know. If not I think Trip advisor should repost your score on our property. 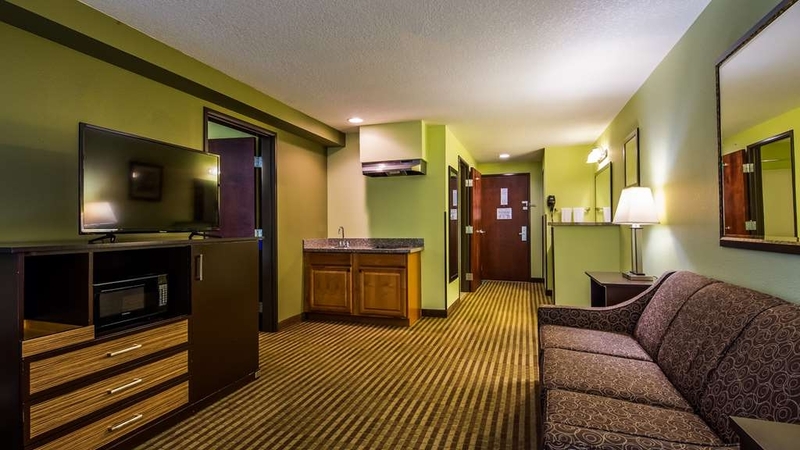 The room was spacious, comfortably furnished, nicely appointed with up-to-date flat-screen television, microwave, refrigerator, granite countertops, good lighting, and nice linens. The bathroom is smallish, but adequate. As others point out, there is a main line train track very close to the hotel. Light sleepers might be bothered by noise. Otherwise, I found the property quite in a second floor room. The breakfast room seemed a little small for this size of property, but was also never crowded. 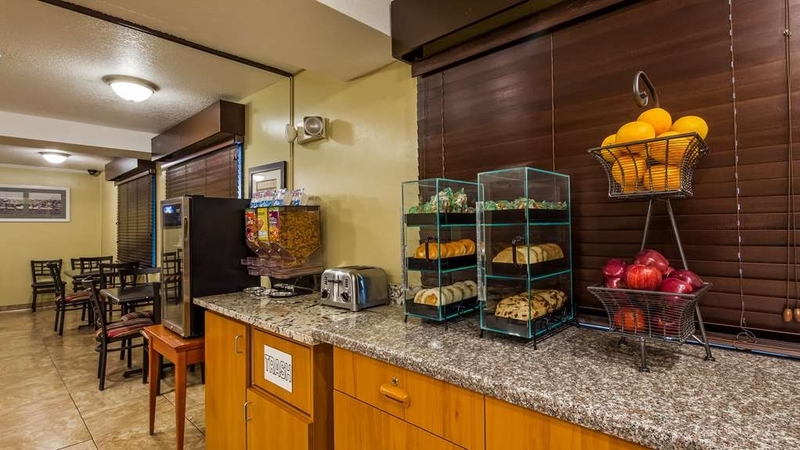 The offerings are standard mid-range hotel with make-your-own waffles, buffet service eggs, sausage, cereals, biscuits & gravy, fruits, limited pastries, yogurt, juices, coffee, tea, milk, etc. Thank you for your most recent stay with us here at the Rama Inn in Ephrata. I will be bringing your concerns and comments to our staff meeting , thank you for bringing a few items to our attention. Please feel welcome anytime. I apologize for the inconvenience of the noise of the train. Also for the pool, our renovations are completed and we did compensate the rate for this inconvenience. We have posted the renovations on line and it was posted on the front desk upon arrival. We offer earplugs upon request. Again, apologies for your inconvenience. When traveling to Ephrata, in the past, we have stayed in surrounding towns, assuming that Ephrata did not have a "nice' choice. We tried the Rama Inn on this trip and was extremely happy ... we will now stay here every time we come we visit. nice place to stay ...if they can keep the hot tub running.I drive for a living and , when I get to the motel the first thing I want is a good soak . unfortunately the last three times I've been there It's been on the fritz. "Great Place to stay in Central Eastern Washington"
great hotel, would stay again. Had a nice pool area. Rooms where clean and was not noisey at all. I would stay again. Breast fast was not bad. Had a lot of tea options for me. You could get the tea all day long, this was a bonus for me. 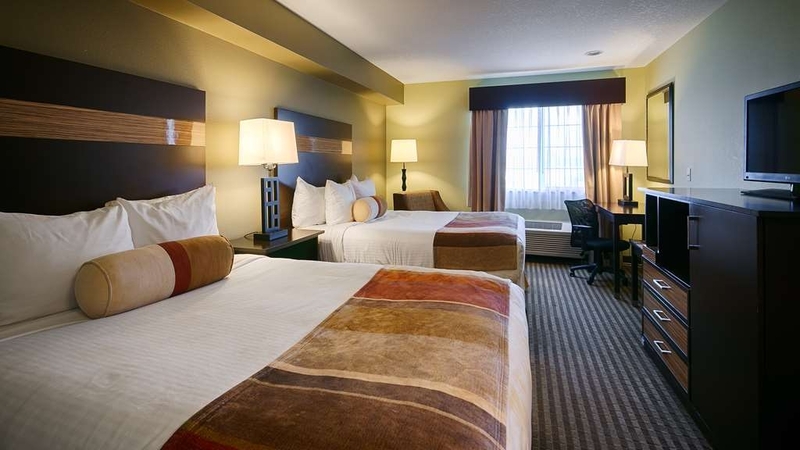 "Always a Great Stay at the BW"
"Clean, Comfortable, Not bad for the price." Stayed in the new section on the far end of the hotel. Very clean, comfortable stay. Decent pool but no workout facility. There is an option to check out a key for an Anytime Fitness gym two or three miles down the road, though. Breakfast wasn't bad. Pretty much what you might expect for free/complimentary, maybe a little better. Noticed some footsteps/door closures from second floor, otherwise fairly quiet. Good TV channel line up. Pleasant stay overall. The check-in was rushed though we were the only people in the "Lobby". The person at the desk dumped a bunch a useless info on us. We would have caught it but her tongue stud got in the way. Didn't matter. The room had a toxic smell to it so we had air on right away to try to get rid of it, that didn't work. The bed was okay, the plumbing worked and the water was hot. The trains didn't wake us up. The breakfast looked pretty So So, so we passed on everything. Just a pretty run of the mill BW. As good as it's going to get in Ephrata and would stay again if the need came up. If this is the improved version of this hotel it must have been pretty bad before. I stayed here a year ago and was very disappointed in the cleanliness of the room and how much it smelled of cigarettes. The changes in the last year have completely turned the hotel around! My room was very clean and well-kept, and smelled fresh. I would not hesitate to stay here again or to recommend that others do so. This Hotel was the nicest place I have stayed at in town. Great people working their, Comfortable, Nice Room, And the sound of trains. Loved it. Great B-Fast Buffet. Nice room with Fridge, Microwave, and every thing you need. I'll be back. Easy to find, and great parking. Service was phenomenal along with the morning breakfast! The hotel is clean! I choose to stay away from the side of the hotel wing that does not have the railroad tracks. The train did go by multiple times when I was there but was before I went to bed at night. My stay has been four to five days at a time so I know this hotel well! 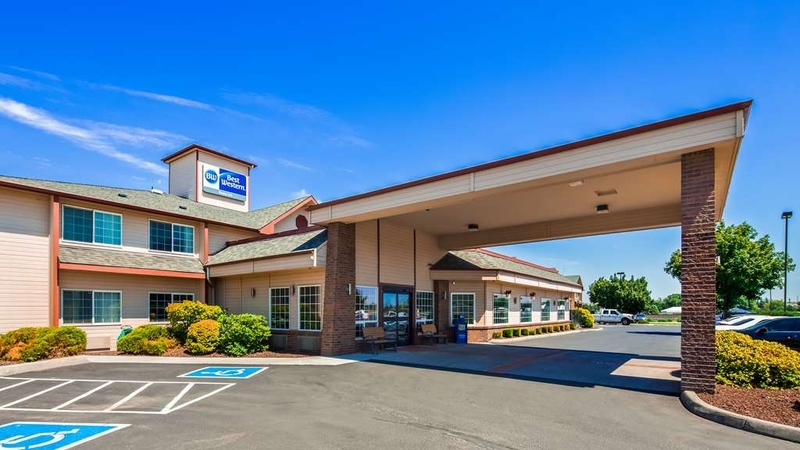 "Best Western in Ephrata, Washington"
We enjoyed our stay. Affordable. Would stay again! They allowed us to have our dog in the room. The beds were super comfy. Breakfast was not the greatest, but had good variety. Hot and fresh cookies were kept out with good selection of tea and coffee. Nice location! It was ok. Breakfast wasn't that great, but not completely awful. Can't really think of much else to say. I parked in the parking lot and my car still had all 4 wheels the next morning. That was cool. There was a bible in the night stand next to the bed, but not a Koran. That was kind of weird. Why a Christian bible but not a Koran? Got a problem with Islam? 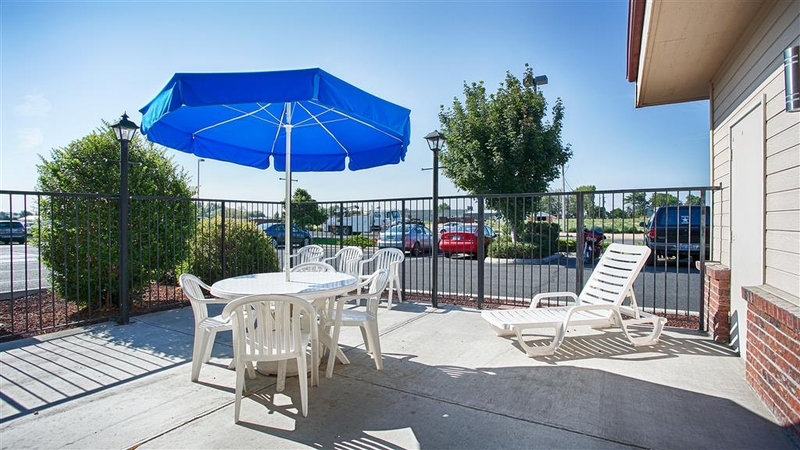 "Best Place to Stay In Ephrata"
Ephrata does not have much choice in places to stay, but unless you want to stay in Moses Lake this is clearly the best place in town. The upkeep may not be 100% (carpet stains in the room, entrances other than the main one were not working) but the people are great. May be a little expensive for where it is but I would stay there again. Thank you for you most recent stay with us here. Sorry to hear of the carpets stains in fthe room. We are slowly being able to update many of our older rooms and will be finshing them up by this winter, Thank you again for your response, looking forward to seeing you again here in Ephratya. "Beds were comfortable (2 rooms)"
Breakfast was good, staff pleasant. Beds were very comfortable, fridge, micro, tiny coffee pot (NOT Keurig). If arriving early, you get what's available - so if a specific room was booked, don't arrive too early. We needed a first floor room close to lobby due to elderly family member having breathing difficulties. Arriving 2 hours early, the only available room was as far away as possible from lobby and on 2nd floor. Thankfully there was an elevator, but the walk was almost too much. Also thankful for air conditioner! Sorry to hear that you didn't get a closer room, when we run fuller its harder to accomdate early before the check in time. Thankyou for working with us on this. Please feel free to come again anytime. 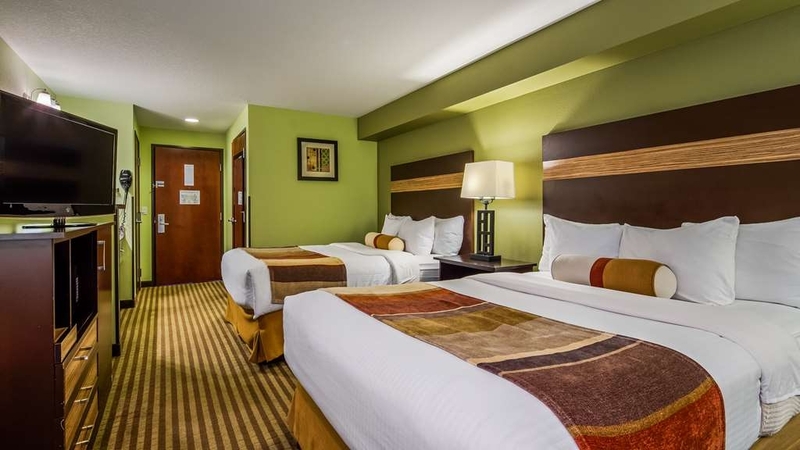 "BEST Western hotel in Ephrata is the best choice." Although I did find a few minor things, the Best Western is still my top pick. 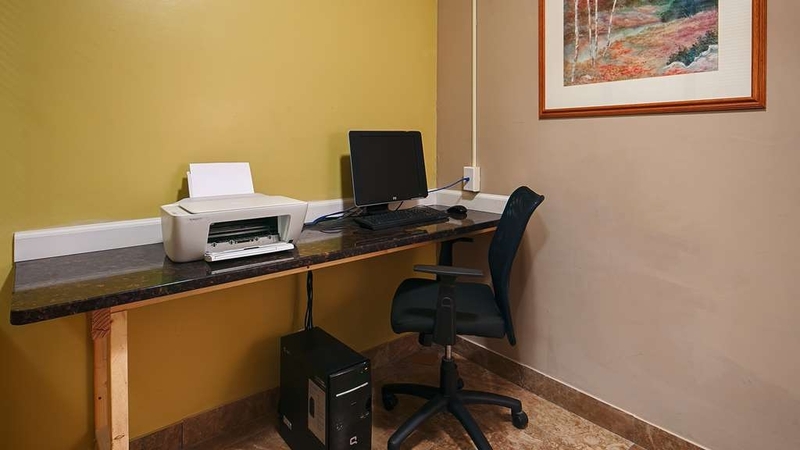 The rooms are spacious with new TVs, microwave, mini refrigerator, coffee makers, and nice work station. The Ac works great, its 82* at 9:30 pm and my room is cool. My minor complaints are as follows: There was a wad of chewing gum stuck on the top of my bed headboard. The carpet in my room has numerous stains, needs at the least cleaned. The king bed mattress is very hard for my old body. On a good note the desk people are wonderful, and even though I'm leaving before breakfast starts they offer you a breakfast to go bag. I would definitely stay here again! Great to know that your stay was good, and thank you for the feedback to ensure a even better stay for the future guests. Your welcome back anytime. A great stay for the price. Comfortable bed. The cleanliness could improve and the cable had no HD channels. The room served it's purpos. There wasn't many other options in Ephrata. This hotel is great for business, I wouldn't stay there for pleasure. We will be looking into the HD Channels, I know I pay for them and some TV may need to reprogrammed for them, Thank you for the heads up . Thank you for doing the survey and have a good rest of your summer. 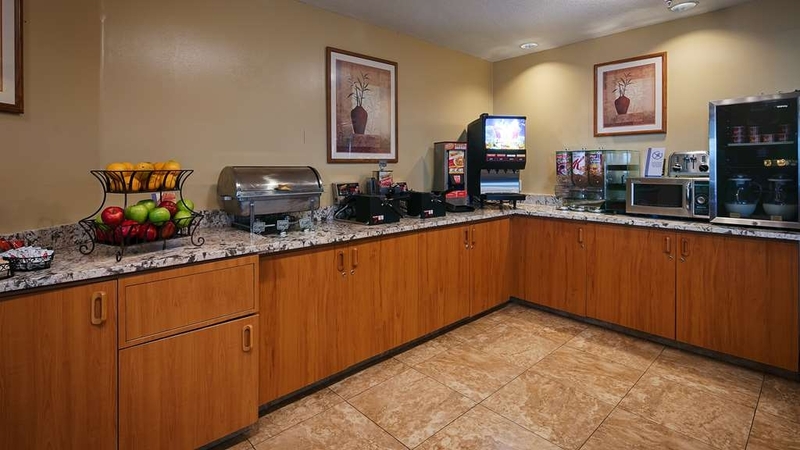 "Clean, quiet, great continental breakfast"
Clean hotel, staff know hospitality! The continental breakfast in the morning is excellent along with the staff working to keep all food filled up. My room was clean with refrigerator and microwave along with nice flat screen TV. I had a very nice stay at the BW Rama Inn. My room was clean, the neighborhood is safe, nice room, clean sheets and a comfortable bed. All the equipment function as expected and free breakfast in the morning. They even have an indoor pool, hot tub and sauna! The hotel was more than accommodating to our Baseball group - top notch service from beginning to end! Despite changes, at the last minute - hotel was more than accommodating with a "can do" attitude. We will be back! Very clean and well decorated. Great morning breakfast that was well prepared and had a great selection. Beds were very comfortable. Very nice to get the military discount. We would definitely come stay again Thank you! The stay was pleasant, staff helpful and rooms pretty clean. The one downside was that when making reservations only 1 person was able to help with group reservations. Which resulted in some confusion and frequent phone calls to confirm the reservation. I have stayed in several best western properties and this is one of the nicer ones. Bed was too firm for us, but that's the only bad thing I can say. Don't know why I have to use 200 characters, let me say what I want and be done! Thank you for the kind words. Glad to have you be a part of our best western family, please come again. 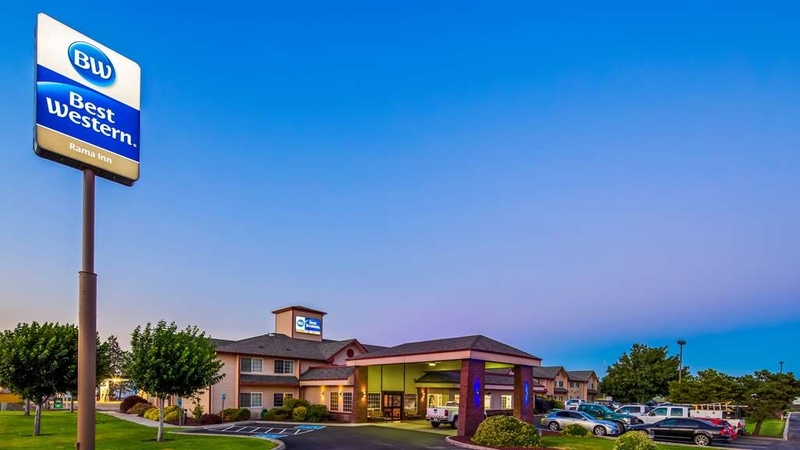 "A nice comfortable place to stay"
We always choose this hotel when coming to Ephrata. 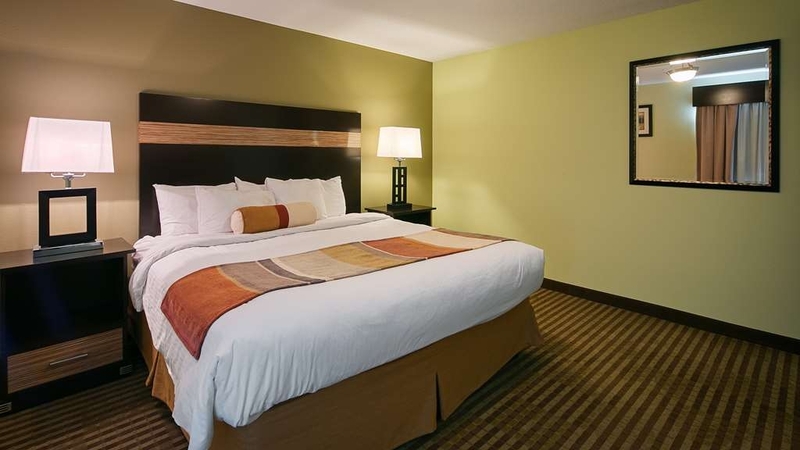 The beds are comfortable and the room is clean and nicely decorated. The pool is kept comfortably warm and is very enjoyable to swim in. Breakfast always has hot items along with waffles. Plus coffee and other hot drinks are available all day. It costs a little more than other hotels in the area, but for the amount of time we spend there it is worth it to us. "Above average clean hotel but"
"Friendly and Added More Rooms"
What a great Best Western!! All of the staff were friendly and helpful. Great, clean rooms. An inside pool for swimming. And a free breakfast that was really good. The staff were really customer service oriented. We will come here again. Thank you for staying here in our little Town of Ephrata. Thank you for the great comments and hope you return again with the same or even better reviews. Glad that our staff is above the norm as hotel go. Have a great summer!!! "Not what was promised, also"
The unfortunate experience started at check in when our room was DOWNGRADED. 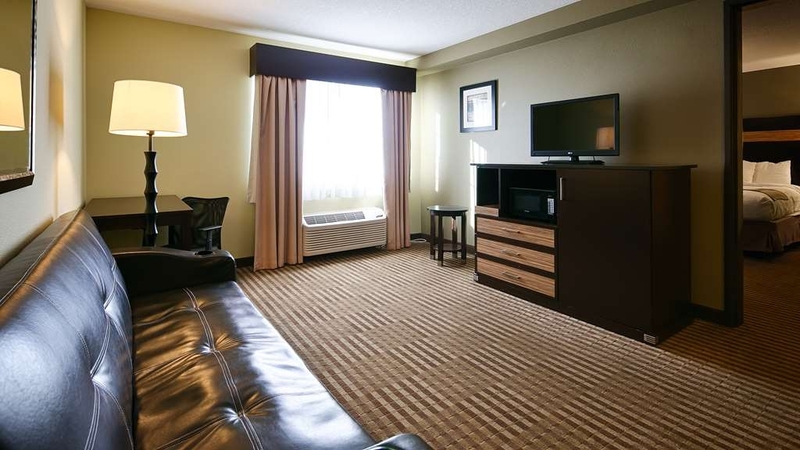 I booked a king suite at Best Western's web site (m.bestwestern.com) for two adults and two children. The site said the room sleeps four. We checked in, received our room assignment, and when we opened the door, it was a standard small room with two queen beds. I immediately went back to the front desk. She said she changed our room because the king suite doesn't sleep four and tried to blame the online error to a third party site, where I immediately corrected her and stated it was Best Western's site with the error. The worst part of her bait and switch was she tried to keep out rate at the higher king suite rate. While the hotel is fine (good beds, clean room, nice indoor pool) I will never stay here again because of the shady way they do business. Not what I expected to hear about my staff > I have looked into this staff member and now they are aware of the room type and rates. Your rate was booked through Best Western, and they are not allowed to change rates they are booked online. I was able to adjust this online at a later date. We are not by far shady in anyway. Most of us here have been here for many years and if you look back at our reviews you can see that this is not the way we do business at any of our hotels. Pleased to know that the room. beds and pool area was to your liking. In the future if you are in need of a hotel in the Ephrata, I wish for you to give us another change to make it right. Thank you for the comments , it helps improve our hotel in many ways. The bill was totally messed up even after verifying a group rate at check in. Additional percentage for BW membership was not given, and the adjusted billing that they made still was over the quoted group rate. Bed was hard as the floor and fridge did not have a door on the freezer section freezing some fruit that we put in to keep cool. We here at the Best Western would like to apologize for any inconvenience regarding the rate mishap. We have two type of beds here, if you were needing a softer one, one could of been assigned to you. We have a lot of requests for harder beds . Just depends on the guest for sure. Very sorry to hear of the freezer not having the cover, that could of been a easy fix at anytime during your stay. But I have investigated this room and the problems have been resolved. Thank you for letting us know how your stay was, we wish to continue to improve in the everyway. We have stayed here many times, and really enjoy our stay. Nice clean rooms, breakfast is good, people are wonderful. Apart from the railroad track just a stones throw away this is a nice place to stay. We always enjoy the swim pool and hot tub. We have stayed here often, love the place and the staff. The breakfast is nice, love the pool and hot tub. They are remodeling and the front looks wonderful. We always stay here when we go to Ephrata. When I drove up I wasn't expecting much. There was construction going on. But the staff was SO nice, the rooms were fine, beds comfortable. Good free breakfast. Easy parking. I would definitely stay there again. Thank you for your response, very nice to hear that you enjoyed your stay, and the construction will be completed for the Lobby in two weeks, please come again. Thanks again from all the Staff. I hope I don't need to return to this area and/or property. It's not that the hotel is that bad, but it needs much improvement. I am a BW Diamond member...I don't need a free upgrade to the nicest room in the property, but I expect more than being placed in a room right next to the bar and railroad tracks. To top it off, there were actually 2 dog biscuits, a beer bottle cap, and a old disposable coffee cup in my room upon check in. I have been here 5 nights and had the room serviced twice. I posted the photos of the trash day 1....guess what, the trash is still here. Gross. Sorry your stay was not the best, the construction of the property improvement is two weeks from being. I do that your are able to come again and try out the property and or town. Thank you for the comments we must have some to improve in the areas needed. Thank you for staying and the wonderful comments, please come again anytime and every time while in the Ephrata area. "good for families and groups"
a bunch of wedding attendees stayed here, we were all happy and content w the accommodations, we wished the breakfast ended a little later than 9 am as we had a late night the night before, the rest of the stay was pleasant and the kids had a ball in the pool and the adults had a good time visiting. The staff was pleasant and very accommodating , and let us in early which was very appreciative ! would stay here again , no problem. 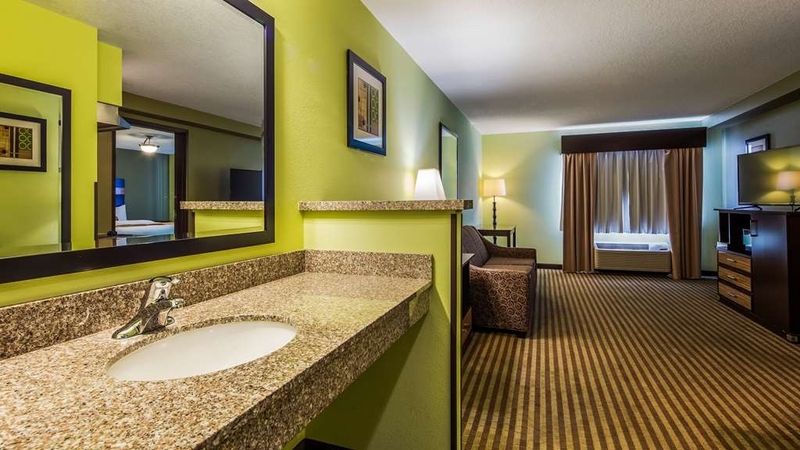 Looking at the Best Western website while planning an overnight getaway for my wife and I. I came across the whirlpool suite option. For a few extra dollars it was money well spent. More than enough room for two in the tub and a little Mr. Bubble made it even more fun. Staff was great and hot breakfast was pretty good too. We just removed the signs and the others are being deliveried this next coming week. Sorry you had to come through the lobby , but it's for the property, guest, and staffs safety that this policy is in effect. Good to hear that the stay was good besides that. Thank you for coming , and please come again. We have stayed at this property many times while visiting our children in Ephrata. 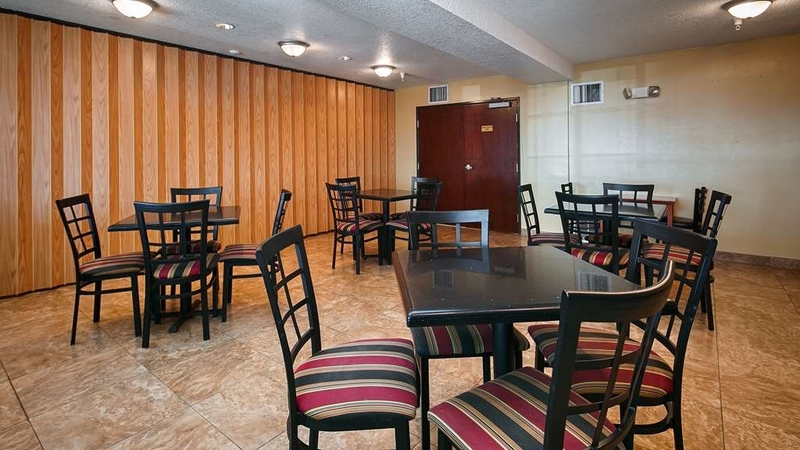 It is a great location with a clean rooms and friendly staff. My only concern is that on the weekend the management do no honor military discounts, but the staff will go out of their way to ensure you get a great rate without it. Not happy with the management on that point, but the staff is great. Always a welcome smile at the desk. Our RV lost a wheel bearing and we ended up being towed to Ephrata for repairs. 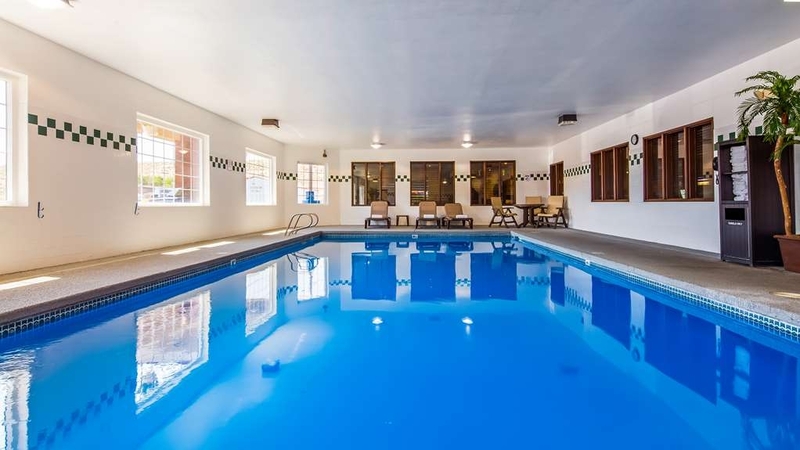 We chose the Best Western Rama Inn as it was the only hotel in town that offered an enclosed pool for our 6YO grandson. 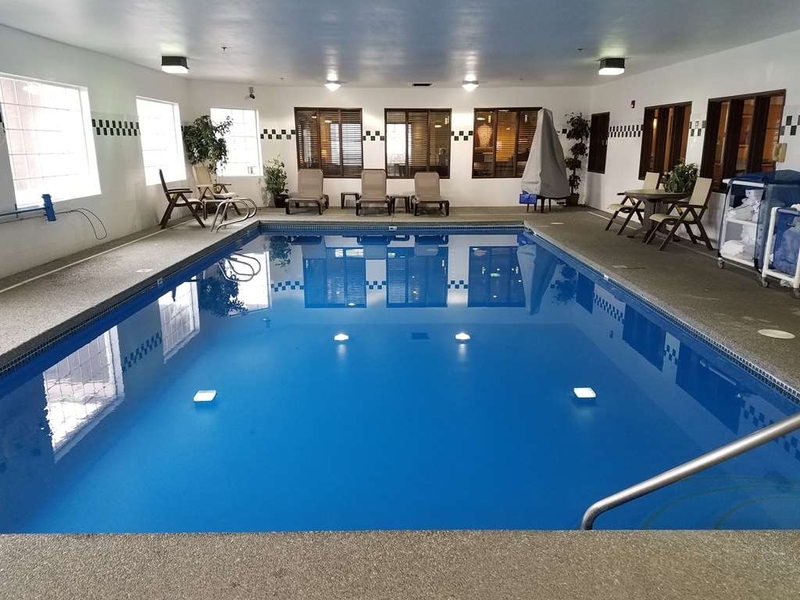 The rates were the highest in town but the hotel was very nice with a good breakfast service, clean rooms and a great pool as reported by our grandson. 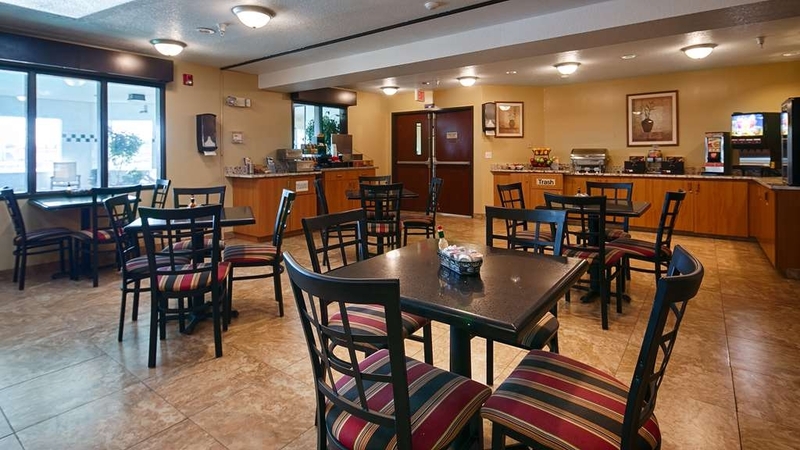 The hotel is located on the SW end of town so it's inconvenient to walk to restaurants. Also, it backs up to relatively busy RR tracks so expect some noise at any hour. It was not loud enough to wake us up but quite noticable. Thank you for staying with us here at the property. Sorry it had to be because of emergency with your RV. Glad to know we were able to help you out. Thank you for the comments. I hope your next trip to Ephrata will ubder better conditions. "clean and excellent place to stay"
My husband and I usually stay at this hotel when we come to town. They are always pleasant. The rooms are always clean and tidy and they serve a good breakfast in the mornings and we love to use their swimming pool. "The Best Western with hard mattress"
I have stayed at this establishment several times when I go to Ephrata, WA. The staff in this hotel is very nice and know their jobs very well. The rooms are always clean and this room is very quiet. Even with the train going by during the night, it's still quiet. Plus, they welcome pets. The ONLY problem I have with this hotel is, that both times I have stayed there, the bed was so hard, I had problems trying to sleep. So, next time I will bring a foam mattress to sleep on. Then it will be perfect. Thank you for letting us know about your stay. Glad to know that you like the rooms and staff here. We try our best to enforce the best costumer guest in the Columbia Basin. As for the bed, I would suggest that you request to stay in the newer wing if you are planning on being in the area of staying with us again. The beds are softer in that part of the hotel. Some people love the firmer side of the hotel, I myself agree with you to have a softer mattress. So please, just ask the front when making your reservation and place in the request. Thanks again for letting us know. Have a great fall and winter season from all of us here at the Best Western Rama Inn. Hotel was a convenient location and easy to get to for the concert we enjoyed at The Gorge. Everyone was nice and very helpful if you needed. Rooms were great, spacious and easy to share with 4 adults. Didn't get to enjoy the pool but looked very clean and larger than some hotels I have stayed in. Thank you for the wonderful comments, please come again if your ever in the area. We love to accommodate. Before arrival I reviewed the reviews like I always do. I was very pleased with my stay and would absolutely stay here over any other hotels in the area. The staff was very helpful, the pool and gym have late hours to accommodate those of us on business trips. I was extremely pleased and felt they are one of the friendliest hotels in the area. Thank you for your response . We are very pleased to hear that your stay here with us was an enjoyable one. Your welcome back on any given day. Have a wonderful rest of your summer from all the staff here at the BEST WESTERN Rama Inn of Ephrata. Spent 3 nights in this nice hotel. Room was clean, well appointed and a very comfortable bed. Daily free breakfast was very good. Not a lot of activities in the area but a lot of beautiful scenery in the area. Leavenworth WA is only an hour and twenty minutes away. Thank you for the kind words. We are happy that your stay was an enjoyable one, hope to see you again. Upon arrival the room seemed clean, but the bathroom had a strong urine smell. I wiped down the entire bathroom with Clorox wipes and left the fan going while we went out to dinner. The room still smelled upon our return. I complained to the front desk and the desk clerked came to the room and re-cleaned the bathroom, but it didn't resolve the smell. The only room left had been reserved for the Best Western Manager. I was told there was nothing else they could do to accommodate us and not even a discount was offered for our inconvenience [poor customer service]. We survived our one night, but will not be back. Thank you for your comments, I do want to clarify two things, the room that was set aside in my name was for emergency purposes only. I asked the front desk to offer to move you into that room and have the HK staff come reclean you room for reselling purpoeses. And as for your rate and being offered a discount, you were giving a discount upon departure, I found out that next moring of the inconvience you and family had at our property and automaticly gave you a 25% off credit back onto your CC on file.if you have any other concerns, questions , comments , please dont hesitate to contact me anytime. GM And again thank you for staying, sorry it was not to your standards and satisfaction.